Grading for Spring Semester is now officially over, so I’ll offer some commentary and a composite image. One thing that strongly impressed me during the Perry event was the intense interest shown by the students and other denizens of our campus. Let’s say, for example, that you’re a student taking a final exam in inorganic chemistry, and that you’re asked to draw the structure of 1,10-phenanthroline. Let us further assert that you’re having trouble remembering the exact structure (a common affliction for this particular structure…). You could leave the question blank, draw a reasonable or unreasonable guess, or just go over the edge and illustrate Amorphophallus titanum. I’ve seen inventive answers before, but the latter is a first. 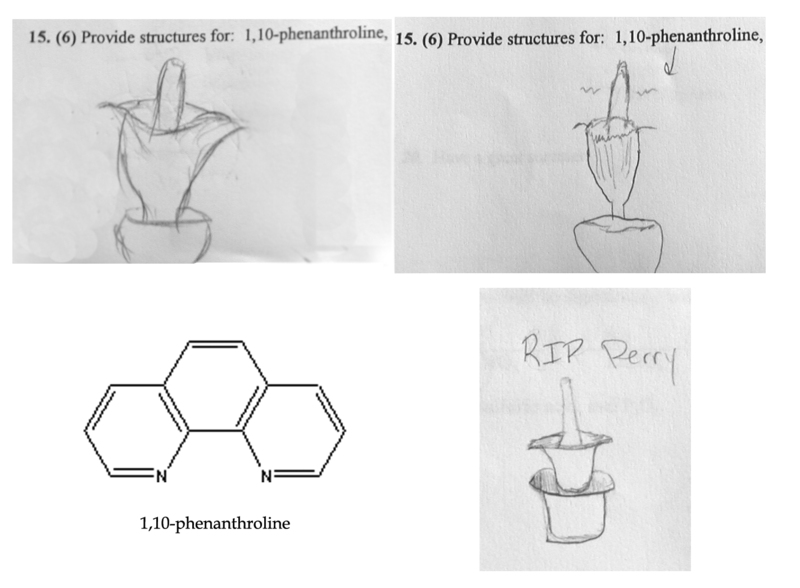 In addition, if you’re someone who mourns the passing of Perry’s recent above-ground parts, you could make a drawing to that effect on the last page of your test. Thanks much to the three of you for this unique grading experience.